Thanks to Automation two special, chronically ill children will receive their wishes. 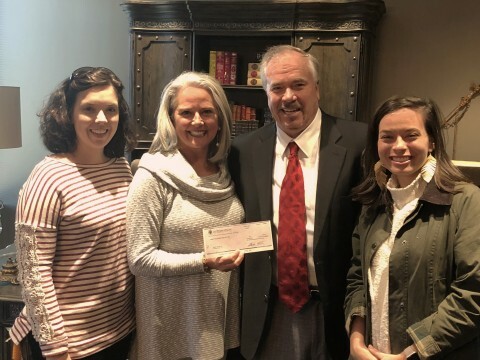 BIRMINGHAM, Ala.--(BUSINESS WIRE)--Stephen Nordness, President and CEO of Automation Personnel Services, Inc., met with the staff of Magic Moments to present a generous donation. Sandy Naramore, Executive Director of Magic Moments, explained that the donation will provide a magical trip or grant a special wish for two chronically ill children and their families. Magic Moments was created to provide moments of joy to children from Alabama who are suffering from chronic, life-threatening illnesses. Just as each child is special and unique, so is the magic moment they choose. Whether it is a trip to Disney World, taking a cruise, or meeting a favorite celebrity, each wish granted is different. For many years, Mr. Nordness has supported St. Jude's Hospital in Memphis. This year, he decided to also support chronically ill children in his home state of Alabama. His donation will allow two special children to enjoy a carefree, joyous event with their families, where they can forget and enjoy time together. Automation Personnel Services, Inc. was founded in 1990 in Birmingham, Alabama. Automation Personnel Services has grown to become the largest independently owned staffing company in the state with offices throughout much of the United States. Automation Personnel Services, Inc. has specialized in providing light industrial employees to a variety of customers across the country for almost three decades. Automation is your “one stop shop” for temporary employees, temp-to-hire associates, executive recruiting, outsourcing, and payroll services. Additional information about Automation Personnel Services, Inc. can be found by visiting apstemps.com. Magic Moments is a 501(c)(3) non-profit organization chartered under the laws of the State of Alabama to make non-medical gifts to children with chronic life-threatening diseases. Our sole purpose is to put joy and hope back in these children’s lives. To date Magic Moments has provided over 4,700 magic moments for children in all 67 counties of Alabama. Not only does Magic Moments grant the children’s wishes, they also provide on-going events to build lasting relationships between staff and families. Additional information about Magic Moments can be found at https://magicmoments.org/. Automation Personnel Services, Inc. grants Magic Moments in Alabama. Two special, chronically ill children will receive their wishes.